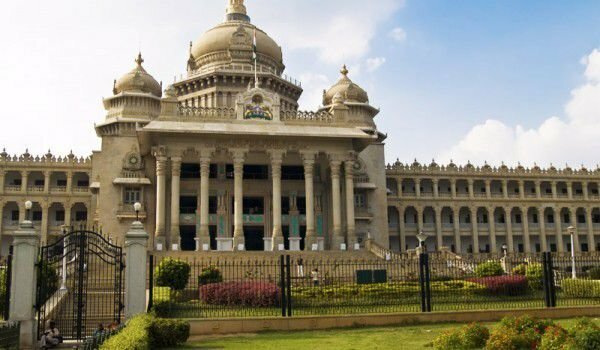 Behind the complex with the name, Vidhana Soudha, lies a majestic building which stands in a central location in the Indian city of Bangalore. In an impressive architectural edifice of Vidhana Soudha is the official seat of the state governor of the southern Indian province of Karnataka. The complex architecture of the palace Vidhana Soudha can not be determined unambiguously. The building is a very successful blend of Eastern styles - the Indo-Saracenic and Rajasthani Jharokha and Dravidian styles. Vidhana Soudha is a broadcast of both the brilliance of the magnificent historical palaces in India, blended with a modern twist of state power - in fact a remarkable structure, consisting of the whole three hundred rooms being located within twenty-two departments of the government of Karnataka. Vidhana Soudha was built in 1950 for Kengal Hanumanthaiah, who was chief minister of Mysore between 1951 and 1956. In fact the statesman visited many countries in Europe, Russia, USA and elsewhere to prepare the concept for the future Indian grand palace, Vidhana Soudha. The foundations of the palace were placed officially on July 13th, 1951, and the completed Vidhana Soudha becomes reality in 1956. Vidhana Soudha with its large proportions is considered the largest legislative building in the territory of India. It is built on four floors and has a level which remains underground. The facade is oriented in an easterly direction and is remarkably adorned with a porch with 12 granite columns, each of which reaches a height of 40 meters. At the main entrance of Vidhana Soudha there is a huge lead staircase consisting of 45 steps and 200 feet in width. Particularly impressive is the facade of the palace Vidhana Soudha with its huge central dome, which reaches 60 meters in diameter. The dome is remarkable for a huge Indian emblem. In the middle of last century Vidhana Soudha was around 17.5 million rupees due to the fact it was during this time that the Palace took the raising of the government complex. Consistent with today's standards the impressive building needs permanent maintenance, which means that several millions of rupees are spent annually, which include repairs, painting, and sundries. If you choose to visit Vidhana Soudha and Bangalore do not miss the evening light show of the building. It runs only on Saturdays and in the days of holidays. At the entrance of Vidhana Soudha you will see written "Government Work is God's work". The State Archives is located in the underground level of the hotel and is also accessible to the public.